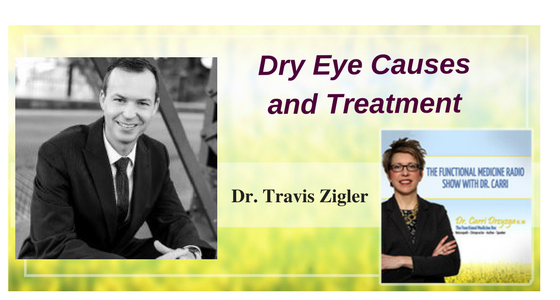 In this episode of The Functional Medicine Radio Show, Dr. Carri’s special guest Dr. Travis Zigler explains dry eye causes and treatment. Dr. Travis Zigler is an optometrist. Travis and his wife Jenna have been actively involved with Volunteers for Optometric Services to Humanity, which is a group that travels worldwide to give eye examinations to people who cannot afford nor obtain such care. They have made trips to Ecuador, Peru, and Jamaica twice, and have plans to participate in future missions. What are the most common causes of dry eye? What diet changes can help our eye health? How quickly can people expect to see changes in their eye health after transforming to a plant based diet? Does blue light hurt our eyes? Do we get blue light from television screens? Can people wear blue light blockers on top of prescription glasses? Do prescription glasses made with blue light blocker coating impact melatonin production throughout the day? What do you think of the f.lux program that people can use on their tablets, computers and phones? Is there an underlying hormonal cause for dry eyes? Can essential fatty acids be used to moisturize dry eyes? Dry eye is considered a syndrome clinically, however, it is a symptom of an underlying inflammation of the body. Dry eye causes and treatment focuses on reducing the underlying causes of inflammation in the three parts of the eye – cornea, conjunctiva, and eyelids. Pharmaceutical treatments for dry eye only reduce inflammation of the eye without getting to the root cause of the underlying disease. It is important to switch to organic, non-GMO fruits and vegetables and focus on green leafy vegetables. All meals are based around spinach and kale because they have a very high amount of lutein that helps with eye health by reducing inflammation. It is recommended to focus on vegetables as the main dish and meat as condiments. Add fruits, nuts, seeds and legumes to make a wholesome meal. Avoiding milk is important, as it is inflammatory. Other ingredients to avoid are sugar, canned foods, anything in a box and processed foods, which are highly inflammatory. A basic recipe for a smoothie for two – one banana, three handfuls of spinach, a little bit of almond milk and water. You could add avocado, chia seeds, flax seeds and then some frozen fruits, like berries. It takes about a week to see changes in eye health after transforming to a plant based diet, because switching from the modern diet will have a period of withdrawal symptoms, similar to quitting smoking or alcohol. With the “Green Smoothie Challenge” after the initial withdrawal symptoms of detoxing in a week or two, one will start to see results and feel incredible in six months. Day 1-7 is the “unbearable stage” with the challenge, where you will have more gas, poop more and feel awful, and you might hate the smoothies. Day 7-14 of the challenge is called the “uncomfortable stage”, where you will not feel great but you will start to feel better. Day 14-21 is the “unstoppable phase”, where you actually start to crave your green smoothie and feel worse if you stop because your body will start to miss the nutrients. One could get addicted to artificial sweeteners as well as stevia in protein powders and end up with headaches and other problems. It is important to hydrate well first thing in the morning with 16-32 ounces of water. This is called the “Hyper-hydration stage”, which boosts your metabolism by about 30% and puts the body in a feel-good state. Drinking about 16 ounces of water before every meal helps jumpstart your digestive system by lubrication. Using computers and smart devices we expose ourselves to blue light even at night, which keeps us awake longer and reduces deep sleep at night. Shutting off electronics and wearing blue light blocking glasses two hours before bedtime will increase melatonin production to help you go to sleep faster and deeper into restorative REM sleep. Blue light is emitted with any device that has a flat panel, including televisions. People can install blue light filters on smart devices starting at 7 or 8pm so that your brain and body starts making enough melatonin as part of your sleep-wake cycle. Prescription glasses can be made with 20-30% blue-light blockers and are sold on amazon and all the way to 100% blockers, which have orange lenses. 100% blocking lenses change the color blue to grey. Blue light blocker coating does not impact melatonin because it is still allowing 80% blue light to pass through to the eyes. The long-term effect of blue light is macular degeneration. It’s important to keep our eyelids clean to avoid blepharitis, or morning eye discharge due to inflammation of the eyelid from overgrowth of a normal bacteria. You can use a hypochlorous acid solution to avoid overgrowth of bacteria in eyelids. Hormonal imbalance plays a big role in dry eyes. Essential fatty acids can be used in smoothies through the four staple foods – avocados, chia seeds, flax seeds, hemp seeds – to moisturize dry eyes. Fish oils must be used only from pure, wild, GMP-certified, fulfilment and sustainable sources. It is important to supplement with minerals and vitamins because most vegetables are now growing in depleted soils. Grounding is the act of walking barefoot outdoors in the sand in order to neutralize and balance the body. Using our devices and screens too close to our eyes can lead to short-sightedness.